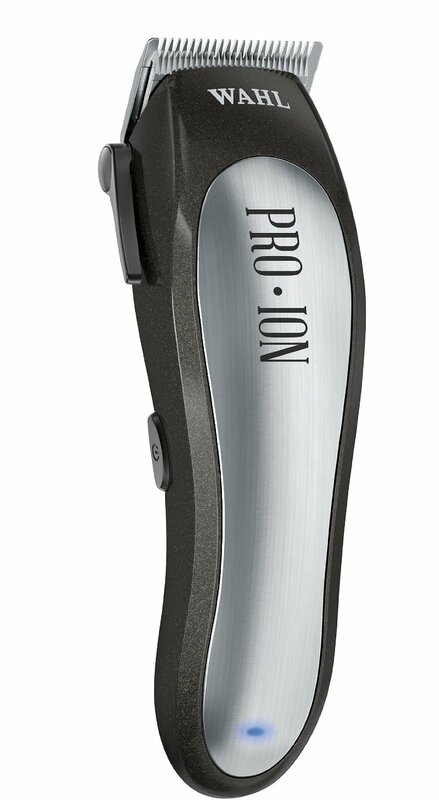 The rechargeable Wahl Pro Ion Lithium Cordless Pet Clipper gives you up to two hours of continuous, cordless operation. Using lithium-ion battery technology, this clipper gives you professional power up to 6,000 SPM with a 15-minute quick-charge option that provides up to eight minutes of use. The high-performance, adjustable blade set easily adjusts to #30, #15 or #10, and the ergonomic design makes grooming a comfortable task. This kit includes a lithium-ion rotary clipper; an adjustable, high-performance blade (#30-#15-#10); a durable 9" storage case; a grooming and styling DVD; stainless steel scissors; a pet styling comb; seven attachment guide combs; a cleaning brush; blade oil; a red blade guard and an English/Spanish instruction book. Lithium-ion rotary clipper, adjustable high-performance blade (#30-#15-#10), durable 9" storage case, grooming and styling DVD, stainless steel scissors, pet styling comb, (7) attachment guide combs, cleaning brush, blade oil, red blade guard and English/Spanish instruction book. Clip the head and face last, being careful of moving ears, mouth, eye lashes and nose. Choose a clip attachment adhering to your desired fur length. Place the clipper flat against the top of the dog’s head with the blade spokes facing to the rear. Pull the clippers towards the back to push fur away from the upper brow. How can I make my dog more comfortable for grooming? It is always wise take your dog for a walk or exercise prior to grooming activities, particularly if he is the type to get restless, antsy or apprehensive. It will diminish the dog’s energy level and make it easier to complete the task. Aromatherapists say the smell of spearmint and peppermint help calm dogs, so it might be worth buying a few scented candles. What is the best way to de-mat my dog? Use a liquid fur detangler or work some baby oil into the mat. Let it sit for several minutes and then loosen and separate using your fingers or the end of a comb. Gently brush out the loosened sections. Severe, stubborn mats may have to be clipped if detangling doesn’t work. Do I really need to brush my dog? Absolutely. Not brushing will lead to the development of mats. Matted hair will pull and inflame his sensitive skin and will be painful to remove. Regular brushing will also keep the dog’s skin healthy by stimulating blood flow and distributing natural oils, while also rooting out parasites. These work awesome! From shaving my head to giving bridle paths and trimming horse. My cat had a huge knot of matted hair on her back. These clips did a great job. I didn’t try to get close to the skin but it was so much easier to comb out what was left. I used this clipper once, while using, I wasn't able to turn off no matter how hard I tried, when finished I laid it in a safe place to let the battery run down. It was pretty loud, and had a lot of vibration! I finished with the sizzors....sigh! I would highly recommend these clippers. I bought others in the past not realizing they had a cord. Unfortunately my cat chewed the box so I couldn't return them. I wish I bought these first. They work well & are quiet, which is what I need for my dog. Wow purchased them for my Shih Tzu and he grows a lot of hair and they worked wonders and talk about the shipping...fantastic, thank you Cjewy! Worked great. Make sure it’s charged all the way first. Very happy with this pet clipper. I needed something easy to use for our own dog as she doesn't like going where there are other dogs! This it perfect! Many options and easy to use. Thank you, Michele S.